Engage ME, which stands for Engage Multicultural Engineers, is a relatively new initiative within the Lee College of Engineering; the effort brings together students, faculty, professionals and alumni of all races, cultures and genders. For the 2018-19 academic year, Engage ME will use a $5,000 grant from the Chancellor’s Diversity Challenge Fund to expand its outreach events. Other goals include increasing the number of scholarships and teaching and research assistantship positions for underrepresented minorities to enable them to better focus on their studies instead of having to work off campus. Program leaders aim to increase Lee College alumni involvement, too. 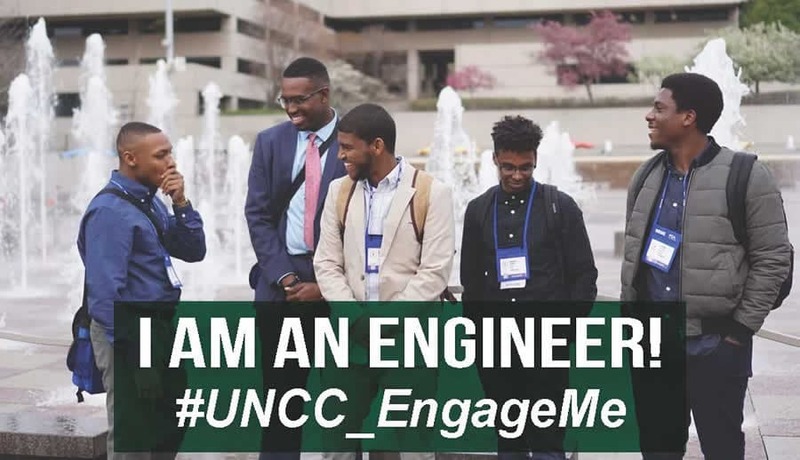 Recruitment efforts have led to the “I am an Engineer” marketing campaign, which includes posters, postcards and social media posts featuring photos of male and female engineering and technology students of all colors. Currently, the Lee College of Engineering undergraduate class is made up of 14 percent female, six percent African American and nine percent Hispanic students. During the 2017-18 year, Engage ME held events with the University Career Center, the Center for Academic Excellence, during the Week of Welcome and during campus diversity conferences. The program helped minorities make connections with existing student support programs and with student societies such as the National Society of Black Engineers, the Society of Women Engineers and the Society of Hispanic Professional Engineers. Engage ME also has participation from professionals outside of the college, in the form of its advisory board; representatives are from Duke Energy, Bank of America, Corning, Sealed Air, Wells Fargo, NAVAIR and the city of Charlotte.